We’ve just released the first trend report of 2015, have a look! This month we have a special addition, as a bonus we asked the 2279 reviewers of the 3D Printer Guide what printer they’re planning to buy next. 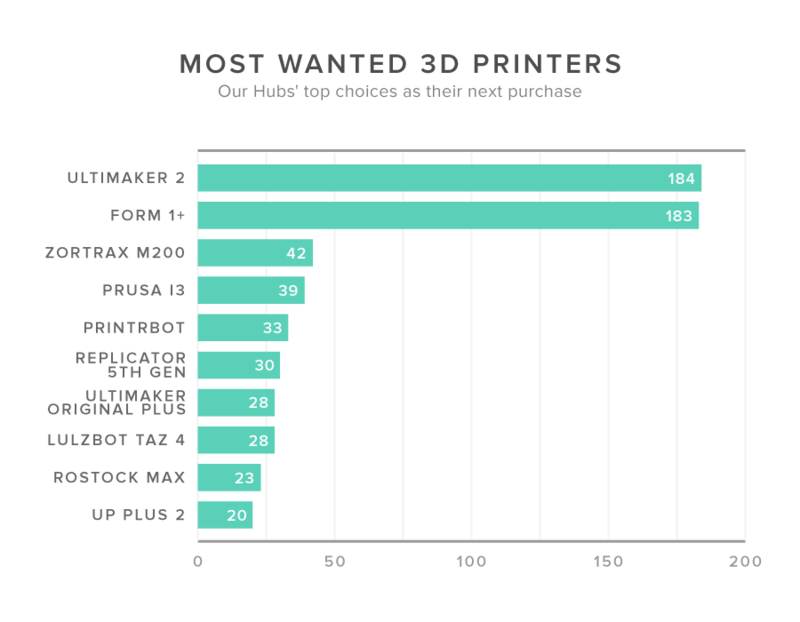 It looks like the Ultimaker 2 and the Form 1+ are by far the most desired printers, while the Zortrax M200 took the bronze. We also measured which manufacturers have the most loyal users, there the crown goes to Lulzbot, followed by Zortrax and Ultimaker. What do you guys think? Any surprises? Would love to hear your thoughts! Hmm. well, that’s a positive spin if ever there was one. So, you’re saying that 75% of those polled stated that they wouldn’t buy one of your top 10. And we’re the people who supposedly know what we’re looking for. There must be some real bargains out there. Anyone care to nominate printers to watch in 2015? Ah! But are you actually intending to vote with your own money? As you know, I’m concerned that 3DHubs is in a position where it could create a self-fulfilling prophesy so I think you need to be very careful about the data you publish and your commentary on it. Im sure 3DHubs doesnt want to risk being accused of pandering to the larger printer manufacturers or attempting to skew a fast-growing and rapidly crystallising market. Makes a lot of sense. I have been using Makerbot 3D printers (Replicator 2, 2X and Z18) for a year in a professional environment (fab lab). After all the trouble I went through and after extensive research on the available 3D printers on the market, I totally agree with what I see here. Ultimaker 2 and Form 1+ are definitely the right choice. Hopefully we’ll get one soon! yes i use the same for about 2ys now i also got a Ultimaker 1 but sold it with in 2 weeks as u need to baby sit it after every print. i still have 20+ reels abs and pla many different colours i had faith in them going to try get a ultmaker 2 to see if its worth it. yes i use the same for about 2ys Replicator 2, 2X and from+1 now i also got a Ultimaker 1 but sold it with in 2 weeks as u need to baby sit it after every print. i still have 20+ reels abs and pla many different colours i had faith in them going to try get a ultmaker 2 to see if its worth it. I wonder about XYZ vs Delta. I like the idea of the delta layout but I wonder what the drawbacks might be. They seem like they may be harder to set up and tune.